Director of the Coordination and Response Division in the Office for the Coordination of Humanitarian Affairs (OCHA) John Ging, briefs a news conference in New York. 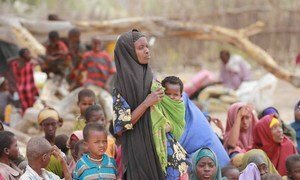 Despite some stabilization, the humanitarian situation in Somalia remains fragile and it is vital that the international community stays the course to ensure that millions of people in the Horn of Africa nation receive the assistance they need, a top United Nations relief official said today. “For Somalia, it does come down to the funding,” John Ging, Director of the Coordination and Response Division in the Office for the Coordination of Humanitarian Affairs (OCHA), told a news conference in New York. “Right now, we are very worried about the prospects for funding,” he stated, noting that only 4 per cent of the $933 million sought this year for humanitarian operations in the country has been received to date. This is a “very ominous” situation in light of the needs in the country, said Mr. Ging, who paid a three-day visit to Somalia last week. Donor attention and action is vital, he added, to prevent a situation similar to that seen in 2011, when some 260,000 people in Somalia died of famine. Despite some improvements in food security, an estimated 857,000 people inside Somalia are currently “in crisis and emergency conditions” in terms of food insecurity, according to the latest assessments. Mr. Ging noted that many of them are in rural areas that are difficult to access, as well as people displaced within the country. Overall, although famine conditions are no longer present in the country, approximately 2 million Somalis are considered food insecure. In addition, there are 1 million people still internally displaced inside Somalia, and another 1 million Somalis are refugees in neighbouring countries. “As humanitarians, we have been working very hard to help the people recover in circumstances which are extremely difficult. The climate, as you know, is very harsh, and the security environment equally so,” Mr. Ging stated. Somalia has been torn asunder by factional fighting since 1991 but has recently made progress towards stability. In 2011, Al-Shabaab insurgents retreated from Mogadishu and last year, new Government institutions emerged, as the country ended a transitional phase toward setting up a permanent, democratically-elected Government. “Somalis have suffered endlessly for almost 25 years,” said Mr. Ging, who visited Somalia’s capital Mogadishu and the town of Baidoa, meeting people in settlements for the displaced and local authorities and organizations assisting people. More than a quarter of a million people died in the famine in Somalia between October 2010 and April 2012, in part because the international community did not act quickly enough, the top United Nations humanitarian official in the country said today.